English impressionist painter, known for her pictures of circus and ballet. ALS. 1p. Park Hotel, Colwall, Malvern, Worcs. 31st October 1945. 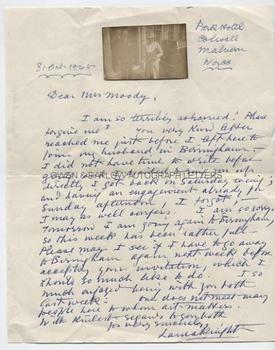 To "Mrs [Olive May] Moody". Together with original snapshot PHOTOGRAPH of Laura Knight. "I am so terribly ashamed! Please forgive me? 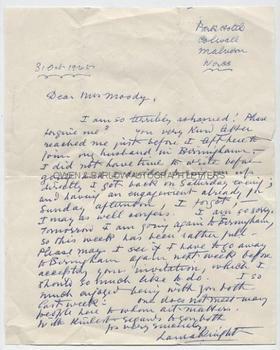 Your very kind letter reached me just before I left here to join my husband in Birmingham. I did not have time to write before going and I decided to ring you up directly I got back on Saturday evening; and having an engagement already for Sunday afternoon, I forgot - I may as well confess. I am so sorry. Tomorrow I am going again to Birmingham, so this week has been rather full. Please may I see if I have to go away to Birmingham again next week before accepting your invitation, which I should so much like to do. I so much enjoyed being with you both last week; one does not meet many people here to whom art matters. With kindest regards to you both." With good full SIGNATURE. 4to. Approx 10 x 8 inches. Fine. The photograph measures approx 2.5 x 1.5 inches. 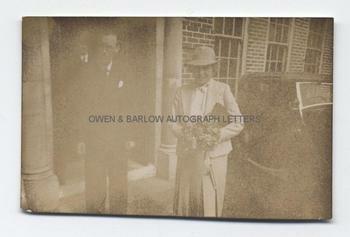 The image is somewhat under-exposed and grainy but is in very good condition. Both the letter and the photograph are from the studio archives of Malvern ARTISTS, Victor Hume Moody and his daughter Catherine. V.H. Moody was principal of the Malvern School of Art (1935-1962) in which post he was succeeded by his daughter. He was sometimes known as the "last classicist" painter. He was also associated with the Malvern Festival. According to a note by Catherine Moody, the photograph of Laura Knight was taken outside the School of Art on 19th June 1940, when she had attended the College's speech day.